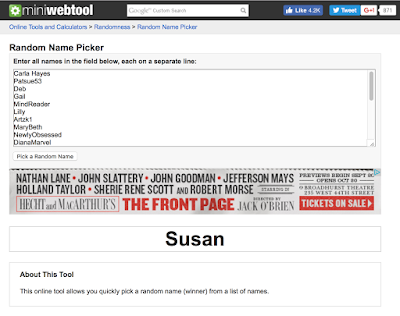 Congratulations to "Susan" whose name was picked at random over at the Random Name Picker at MiniWebTool.com! Susan wins a signed, advanced copy of Jodi McIsaac's Bury the Living! Quick-and-Awesome Droughtlander Contest: Jodi McIsaac's "Bury The Living"
OK Y'all...listen up...MOP is having a lightning fast Droughtlander contest and it's pretty damned cool!!! Not only can you win a copy of Jodi McIsaac's "Bury the Living", but that copy is a SIGNED, ADVANCED READER'S COPY before it comes out on September 6th! Why Bury the Living during Droughtlander, you ask? All you have to do is comment right below this post, here on the blog and tell us how you're passing the time during Droughtlander. A winner will be chosen at random, tomorrow night, Tues, Aug 30th at 5PM EST!!! Thanks for entering everyone! It is now Tuesday August 30th @ 5:00PM Eastern. The Contest is now CLOSED and the winner will be announced shortly! UPDATE #2 - WE HAVE A WINNER! 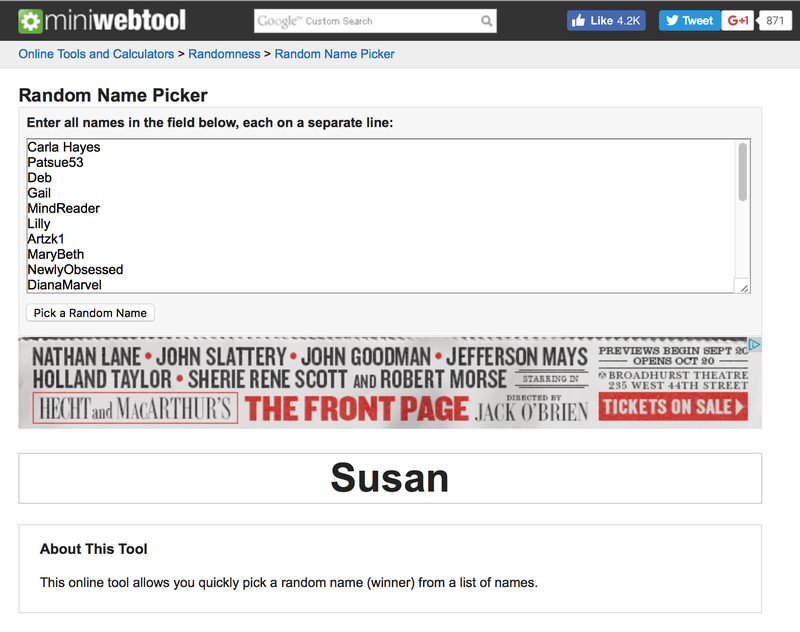 Congratulations to "Susan" whose name was picked at random over at the Random Name Picker at MiniWebTool.com! Susan wins a signed, advanced copy of Jodi McIsaac's Bury the Living! Susan, please send your full name and address to me at carol@myoutlanderpurgatory.com! :) Way to go!! DAVID BERRY cast as LORD JOHN GREY!!! 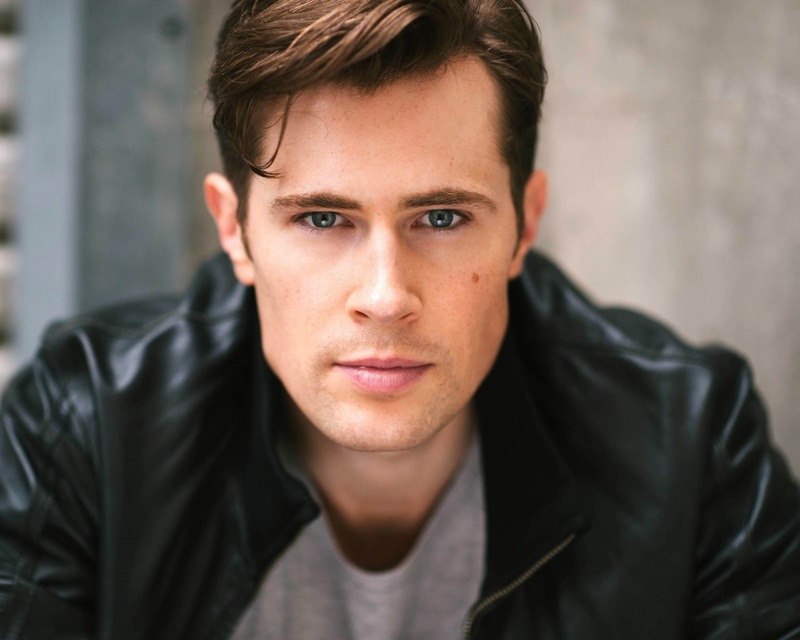 Beverly Hills, Calif., August 29, 2016 – Starz, in association with Sony Pictures Television, has announced today that David Berry (“A Place to Call Home”) will play the role of “Lord John Grey” in the hit series “Outlander.” The series is adapted from Diana Gabaldon’s international best-selling books by Ronald D. Moore (“Battlestar Galactica,” “Star Trek: Deep Space Nine,” “Star Trek: The Next Generation”). Lord John William Grey is a steadfast and honorable British subject, torn between a finely-honed sense of familial duty and a strong moral compass of right and wrong. He is boyishly handsome with an upper class rearing -- the consummate gentleman. However, a scandal from his past has relegated Lord John to an undesirable position as governor of a desolate prison in Northern Scotland. Acting and performing has always been David's passion however his path to acting has been rich and varied. David attended school on a music scholarship for voice, dividing his time between schoolwork and a professional singing career, performing for Opera Australia, as a soloist at numerous concerts and festivals and singing the National Anthem at some of the nation's top sporting events. Some highlights include singing as a juvenile lead in Opera Australia’s productions of “Albert Herring” (1997) and “Werther” (1998), and soloist in the Schools Spectacular in 2000/2001. Upon graduating David has built up an impressive list of Film, TV and Theatre credits. Audiences will be most familiar with David for his role as James Bligh in the popular Australian Television show “A Place To Call Home,” for which he was nominated for Most Outstanding Supporting Actor in the 2016 Logie Awards. When he isn’t working on stage or screen, David tours both nationally and internationally as a singer with the highly successful corporate entertainment act, Scream and Shout. Credits include: Lucien Chardon (lead) - Lost Illusions (NIDA 2010), John Wilkes Booth (lead) - Assassins (NIDA 2010), Jean - Men Without Shadows (NIDA 2011), Arthur (lead) - A Little Touch of Chaos (New Musicals Australia 2011), Jack Driscoll (lead) - King Kong the Musical (workshop) (Global Creatures 2011), Alastair - Miss Fisher’s Murder Mysteries (ABC TV 2011), Logan Meyer - Home and Away (Channel 7 2012), James Bligh (lead) - A Place to Call Home (Channel 7, 2012), Brian Cleaver (lead) - The Crater (ABC TV, 2014), Roy/Priest - The Light in the Piazza (NIDA, 2014), Wintergreen (lead) - Of Thee I Sing (Squabbalogic, 2015). “Book Three” will be based on the third of the eight books in the Outlander series, entitled Voyager, The third season of “Outlander” picks up right after Claire travels through the stones to return to her life in 1948. Now pregnant, she struggles with the fallout of her sudden reappearance and its effect on her marriage to her first husband, Frank. Meanwhile, in the 18th century, Jamie suffers from the aftermath of his doomed last stand at the historic battle of Culloden, as well as the loss of Claire. As the years pass, Jamie and Claire attempt to make a life apart from one another, each haunted by the memory of their lost love. The budding possibility that Claire can return to Jamie in the past breathes new hope into Claire’s heart… as well as new doubt. Separated by continents and centuries, Claire and Jamie must find their way back to each other. As always, adversity, mystery, and adventure await them on the path to reunion. And the question remains: when they find each other, will they be the same people who parted at the standing stones, all those years ago? Diana Gabaldon’s eight-book series has sold more than 26 million copies worldwide and all eight books in the series have graced the New York Times best-sellers list. The “Outlander” series spans the genres of romance, science fiction, history, and adventure in one grandiose tale. Starz retains all domestic multiplatform pay TV rights to the original series. For more information, go to the official Outlander Facebook Page<http://www.facebook.com/outlandertvseries.starz> and follow @Outlander_Starz <https://twitter.com/Outlander_Starz> on Twitter and Instagram. Join the conversation with #Outlander and #STARZ. UPDATE: As of 9/12/16, the sale is over, but keep checking because different colors are on sale from time to time! They like to mix it up! 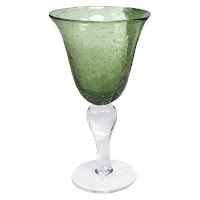 Oooh check out this way cool sage Artland Goblet from Target! The goblets come in a variety of colors...and a few of the colors are on sale this week at various prices. The BEST deal? A SET OF 6 of the sage goblets is on sale at Target this week for $28.79! Outlander Kitchen: Let's Fact-Check, Shall We? This is the Outlander Kitchen, written by Theresa Carle-Sanders. It is based on the Outlander book series by Diana Gabaldon. It is not a Scottish cookbook. It is not based on the Outlander television series on Starz. It is not a research book about Scotland. It *is* a terribly yummy read, with lots of recipes and references to the wonderfully diverse dishes and situations mentioned in the Outlander series. If you are a fan of the Outlander series by Diana Gabaldon (or if you just want some fabulous new dishes to add to your kitchen lineup), I encourage you to buy it. Um, ahem, just making sure you all know about this AWESOME book that HERSELF has written; I Give You My Body. She's been threatening for years, and has finally done it, y'all!! I canna WAIT to read this; the small sample I perused was juicy as hell. And THANK YOU Diana, for hopefully helping countless other writers get it RIGHT going forward. 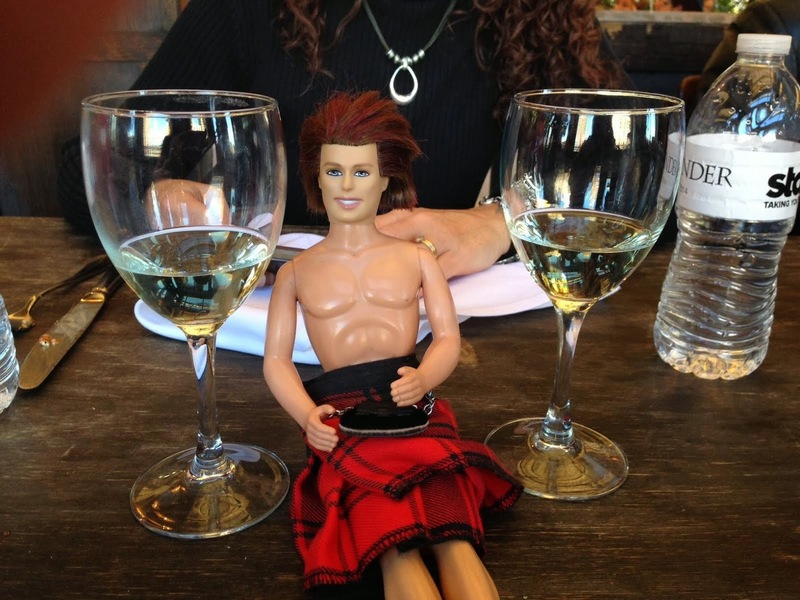 This is Tracey and me when we travel for Outlander events. 😂 I love these two! !